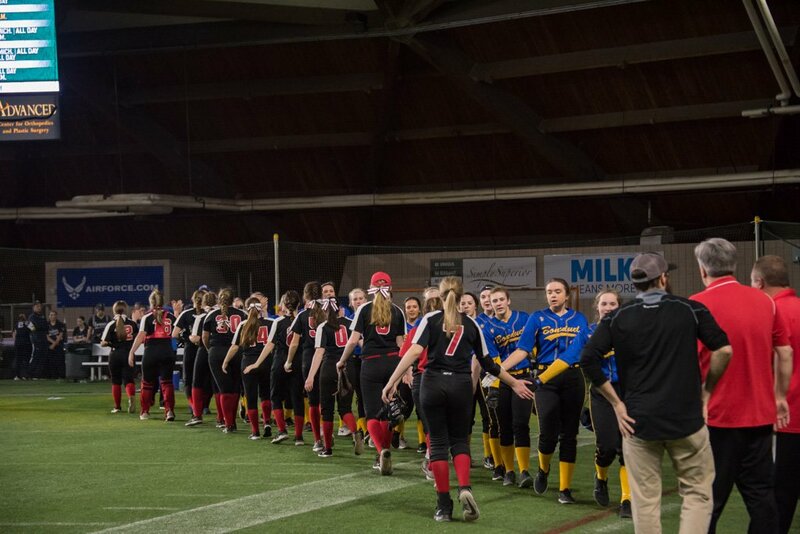 The teams lined up to congratulate each other one a game well played. 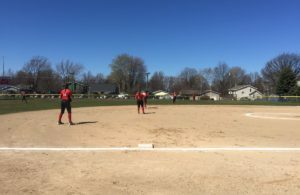 Marquette, MI – The Marquette Redettes Softball Team lost to the Bonduel Bears this afternoon at the Superior Dome in downtown Marquette at the annual Spring Swing Invitational. 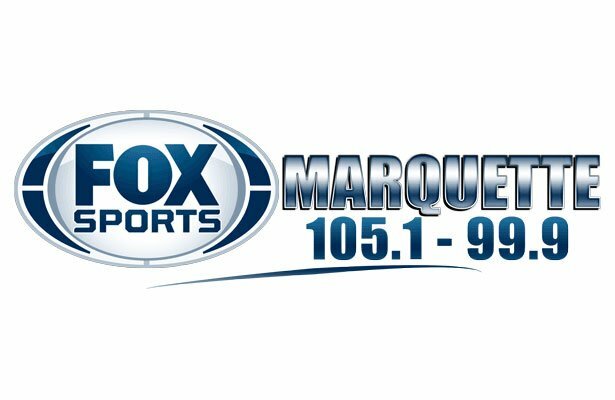 The Redettes had a promising lead at 4-1 in the third inning, but the Bears took home the 7-4 win on the second day of the invitational on Fox Sports Marquette 105.1-99.9. Bonduel got things going with an immediate out on Marquette’s first at bat. The Redettes were able to shake it off and start to fill up the bases. With two outs and a player on second and third, Taylor Myers allowed a two-run score off her hit and trotted all the way to second base giving the Redettes a 2-0 lead going into the bottom of the first inning. Bonduel chipped away at the Redettes’ modest lead with an early run for a score of 2-1. Redettes’ pitcher Rayna Warchock struck out two consecutive Bears to help Marquette wrap up the bottom of the first inning and hang on to their 2-1 lead. There were no runs scored by either team in the second inning. Marquette had the bases loaded at one point at the top, but the Redettes couldn’t quite make it all the way home. A home run from Maddie Carter for a two-run score was just what the doctor ordered for Marquette at the top of the third. The Redettes improved to 4-1 over Bonduel. Marquette was slow to close out the third inning, however. Bonduel, with runners on second and third, popped off a hit to bring them home and improve to 4-3 behind the Redettes. The Redettes play again tonight at 5:30. The top of the fourth saw two straight strike-outs for Bonduel. Alexis Trombley made it to first after her hit, however, to get the Redettes on base. Sofia Van den Ende took the walk to keep the Redettes alive in the inning. Taylor Myers followed up with a walk as well to load up the bases for a chance to improve the Redettes’ score. Bonduel shut down Marquette’s hopes though, putting away the Redettes on their next at bat. The Bears took the lead at the bottom of the fourth with a two-run score to bring it up to 5-4 over the Redettes. With no outs and time running out, Marquette looked to be in a little trouble. After a handful of walks, the Bears brought a few more home for a score of 7-4. Amanda McIntyre took the place of Warchock at the mound. McIntyre was able to secure the outs to keep the Bears at 7-4. With a 75-minute time limit on today’s game, the Redettes were not afforded a chance to answer Bonduel. In spite of the tough loss, this weekend’s invitational is only the beginning of the season. Redettes Softball will be in full swing once the snow melts. Tune in to Fox Sports Marquette 105.1-99.9 for more girls softball action. 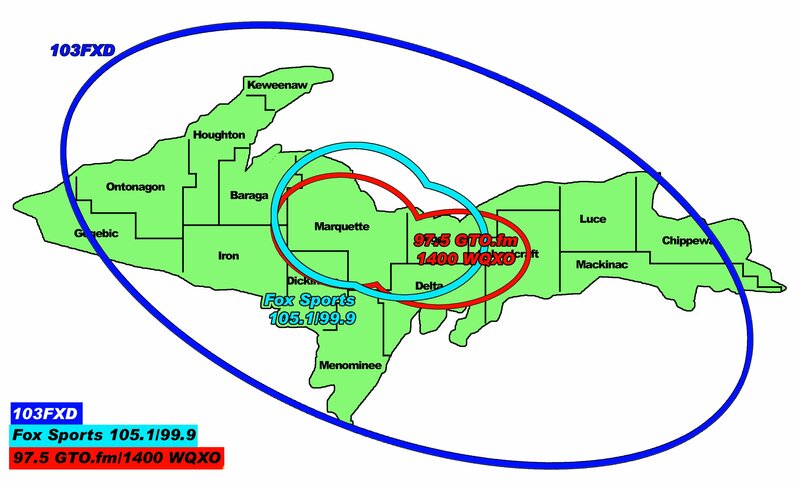 Don’t forget, though Fox Sports Marquette is not broadcasting it, if you missed the first two Redettes games, you can catch their third game of Tournament tonight at the NMU Superior Dome. The girls will take the field to face the Calumet Copperkings! 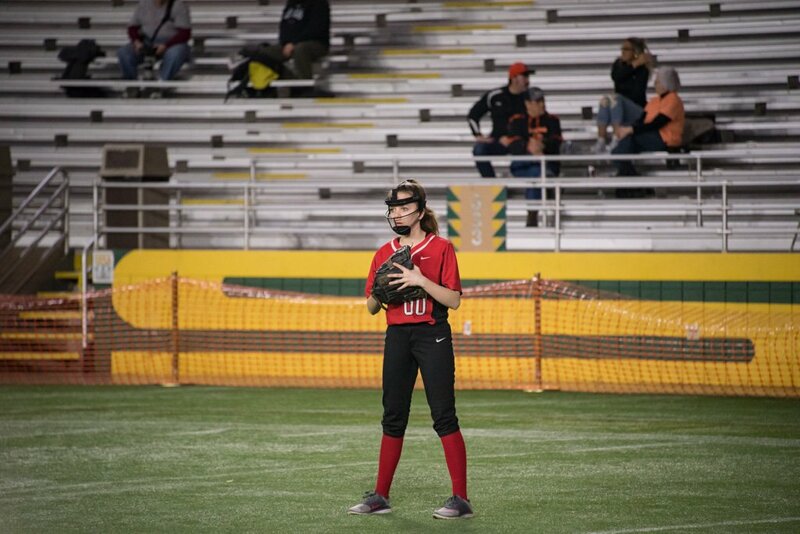 Listen to a recording of the live broadcast for the Marquette Redettes softball game against the Bonduel Bears. One of the Marquette Redettes outfielders. The Marquette Redettes played the Bonduel Bears today. This girl had a strong pitch! The Redettes were throughout tough ones today! The Redettes are up to bat. Can she make it to second? Bonduel was really tried to send some tough pitches out. The Redettes played a great game this afternoon. Some of the ladies waiting for their turn to bat. This is the 17th Annual Spring Swing Tournament. Trying to sneak to third. Marquette Redettes vs the Bonduel Bears. Taking a short break on the field to regroup. Marquette’s umpire preparing for the next pitch. 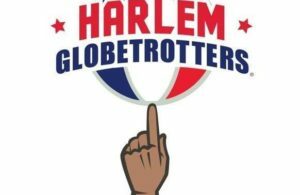 There were about 18 varsity teams that attended this weekend’s tournament. Drop by the Superior Dome to catch some games. Coming in off the outfield. The Redettes take a final time out before the end of the game. 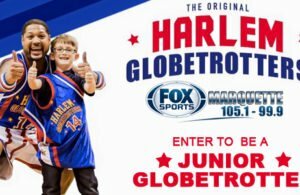 Is Your Child The Next Junior Globetrotter? Register and Find Out!